UFO Hoaxes? There’s an App for That! I knew that it was possible to create all manner of digital UFOs in photographs. What I did not realize was just how easy it has become. 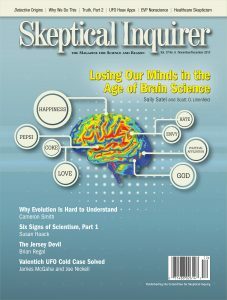 Taking Our Medicine: What Hope for Skepticism in Healthcare? Neuroscience and its new brain imaging tools are great achievements of modern science. But they are vulnerable to being oversold by the media, some overzealous scientists, and neuroentrepreneurs. Our difficulty accepting evolution isn’t just because some religions oppose it or that it is complicated—it isn’t. The problem may be a result of how our minds work. What did he see? The missing piece of the puzzle in a strange ‘UFO’ case involving the crash of a young pilot off Australia has been identified. The story of the Jersey Devil has become layered with myths and variations, obscuring the original events that gave rise to it. Not surprising considering the story comes from colonial-era political intrigue, Quaker religious infighting, and a future Founding Father. Where Is the Science in Electronic Voice Phenomena? While the evidence they provide is scientifically debated, some tools such as audio recorders have become popular mainstays of the paranormal investigator. Psychic Successes or Memory Failures?